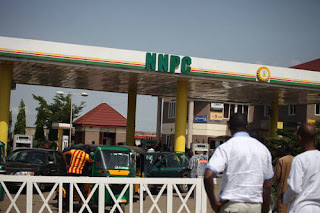 The Nigeria National Petroleum Corporation, NNPC has come out to debunk the news making rounds that it is planning to increase the pump price of petroleum products in the country. This was disclosed on Thursday by the Group Managing Director, GMD of NNPC, Maikanti Baru while speaking during the Kaduna Trade Fair. He said the federal government has no plans to increase the pump price of petrol above N145 which it is currently being sold. Baru said he was speaking based on the promise made by President Muhammadu Buhari not to further increase the price of petrol in the country. He also hinted that oil exploration in Northern Nigeria will continue, as this will enable the NNPC do a massive appraisal of the discovery of gas reserves made in 1999 in the region. Baru noted that drilling has been going on smoothly and that as of Thursday morning, the corporation had dug 10,075 ft deep with a target to reach 14,270 ft exploration. “The main purpose of this well is to start some massive appraisal of the discovery that was made way back in 1999 of some gas reserves in Kolmani River I and so far the drilling has been going on smoothly to enable exploration. “Well, we will do the needful, if we need to probe any particular section we will take our time to do it, our target date is to see that by the end of May, we complete exploration on that particular well and move to Kolmani River III which site is almost ready for the rigs to move there and from there we move to other locations,” he said. News had emerged this week of plans to increase the pump price of petroleum product if the depot owners continued to sell the product to them for between N136.50 and N137 per litre. The threat was made by the Chairman of the Independent Petroleum Marketers Association of Nigeria, IPMAN, Ore depot, Shina Amoo. The threat was however denied by IPMAN Chairman in Kano State, Bashir Dan-Malam, while addressing journalists on Tuesday in Kano. “IPMAN will not sell the fuel above the government’s approved price because there are availability of the product at all the 21 government depots in the country. “So, I am calling on all marketers to go to these depots and buy the commodity but any marketer who goes to private depots is doing so on his own volition. “All the 21 depots are selling the product to marketers at the approved price of N133.28 but private depot owners are selling theirs at between N136.05 and N137 per litre. “So, marketers have the right to either buy from government depots or from the private depot owners at a higher rate, “ he said. President Buhari had May 11, 2016 increased the price of petrol from N87 to N145. The increase had been met with many condemnation, with human rights lawyer, Femi Falana describing it as immoral. “Hence, without any public debate or consultation with relevant stakeholders whatsoever the federal government took the Nigerian people by surprise yesterday when it decided to increase the pump price of petrol from N86.50k to N145 per litre. Not too long ago, the federal government had supported the imposition of higher tariffs paid on epileptic supply of electricity by consumers. “Since the Petroleum Products Pricing Regulatory Agency (PPPRA) which is statutorily empowered to recommend the price of petroleum products has not been reconstituted the unilateral decision of the Executive Secretary of the body to fix the pump price at N145 per litre is ultra vires and illegal in every material particular. “In view of the illegality, insensitivity and immorality of the price increase the federal government should cancel it, revert to the status quo and consult widely with all relevant stakeholders in the society,” part of Falana’s statement said. O 7 O 1 6 6 O 7 O 6 O FOR BOOKINGS AND ENQUIRIES.NOTE THAT MINIMUM PURCHASE IS 1OO BAGS.